Submissions are welcome on the draft Annual Plan and Budget 2013-14. The detail of what we will do and how we will fund our activities is agreed each year in the Annual Plan and Budget. The draft Annual Plan and Budget 2013-14 is now out for statutory consultation. Council’s Future Melbourne Committee will consider any written submission received on or before Friday 7 June 2013, at a meeting to be held on Tuesday 18 June 2013 at 5.30pm in the Council Meeting Room, level two, Melbourne Town Hall, Swanston Street, Melbourne. If a person wishes to be heard in support of their submission they must include the request to be heard in the submission and this will entitle them to appear in person or by a person acting on their behalf before the meeting of the Committee. Robert Doyle: What would you remove from the budget? They could also scrape Lord Mayor’s Free Booze Bar, Free Councillor Car Parking and Staff Overseas Junkets. Robert Doyle has been on the boozer racking up over $10,000 in plying his mates and associates with free alcohol (top shelf booze) to lubricate the discussions and Town hall deals. Any excuse for a party at no cost. of course Council CEO Kathy Alexander tries to justify the Free booze policy because a drunk Councillor is unlikely to pay detailed attention to what gos on behind the closed doors of Town Hall. after all if they all have their snouts in the tough they can not complain about others doing likewise. Doyle joins a host of ex-pollies that have suffered the “bit to much drink whilst on the job”. Most notable being former disgraced Democrats Senate leader Andrew Bartlett who would turn up in the Senate chamber pissed as a newt abusing his fellow Senators. Questions are being asked as to the Council’s responsibility and right to supply alcohol to staff and guests. It certainly does not come under the umbrella of out of pocket expenses unless they mean “output of your pocket and into theirs” expenses. The free drinks LM booze bar should be closed down and if the Councillors and staff want a drink then they should visit a licensed bar outside of the Council and pay for their own drinks and not expect ratepayer’s to pick up the tab. 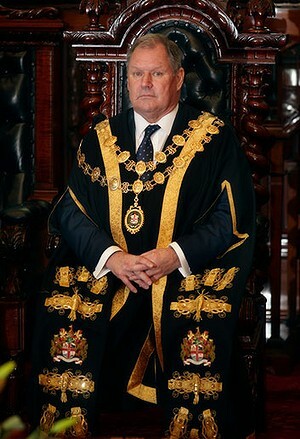 LORD Mayor Robert Doyle has racked up a private bar bill of almost $10,000 in a single year. Documents obtained through Freedom of Information reveal councillors and council staff spent $209,816 on food and alcohol in the 12 months to March this year. The council’s total alcohol bill was more than $44,245. The cost of restocking the private bar in the Lord Mayor’s office with beer, wine and spirits was $9652.66. It included $1142 spent in March last year, $1163 last June and in October included six bottles of Bendigo shiraz at a cost of $144. More ratepayer funds were used to buy a steady supply of chips and nuts for the office. Councillors also have their own “refreshment room” where drinks are available free of charge. Mr Doyle, who belted out a rousing rendition of Vanilla Ice rap track Ice Ice Baby at the council’s Christmas party last week, defended the spending. “The Lord Mayor’s office hosts many civic functions for stakeholders, community groups, visitors and dignitaries as part of our official duties,” he said. It seems Christmas cheer does not come cheap at the council either. More than $20,000 was spent on a yuletide bash for staff last year. Ratepayers also funded $625 for cocktails and $244.70 for drinks at an annual report “celebration”. More than $1300 was spent on food and drinks for a staff farewell. And more than $2060 was spent on a dinner with Adelaide councillors. Council chief Kathy Alexander recognised the council was funded by public money but also defended the food and alcohol spending spree. “Councillors and administrative staff can incur reasonable expenses in the course of their work and are accountable for this spend within the annual budget,” she said. “The stock in the councillors’ and directors’ refreshment room is used for visiting dignitaries or meetings with relevant stakeholders. Calls for Doyle to resign! LORD Mayor Robert Doyle has caused a storm by suggesting there is no evidence passive smoking causes lung cancer. The lord mayor was discussing plans by Monash City Council to consult residents about the possibility of banning smoking at outdoor cafes and sporting events. He said there had been no discussion at Melbourne City Council to extend smoking bans. Mr Daube said Cr Doyle was behind the times, with jurisdictions throughout Australia – including Western Australia – introducing laws to curb smoking at outdoor cafes. The chairman of lung service at Peter MacCallum Cancer Centre, Associate Professor David Ball, said no one knows the point at which tobacco smoke becomes safe. Professor Ball, who has worked at Peter MacCallum for more than 30 years, said: ”The most sensible advice I would give to people is to avoid tobacco smoke altogether. Professor Ball supported banning smoking in outdoor dining areas. She said the evidence was ”incredibly well documented”. ”Given that Robert Doyle is the chair of Melbourne Health, which includes the Royal Melbourne Hospital, he has probably got many doctors there he could check it with,” she said. 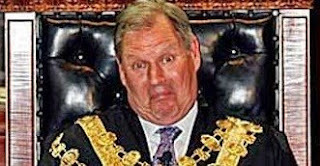 There is ongoing speculation that Melbourne’s Lord Mayor, Robert Doyle is actively using City Council resources to manipulate and interfere with the Liberal Party Federal pre-selections which are being held this month. Doyle has teamed up with outgoing Liberal Party member Peter Costello and his long time friend and power broker Michael Kroger. Doyle staffer Tim Singh, who is on the Council payroll as Doyle’s media adviser, has been enlisted to promote and assist in the media smear campaign. It is one thing for Doyle to be actively engaged in State and Federal Politics but it is another to be using Council resources leaving town hall open to the allegation of corruption. A quick review of the Lord Mayor’s telephone expenses will confirm the allegations. If the allegation of Council staff involvement are true then this raises a number of issues that should be investigated by the State Government or the Ombudsman and brings the City Council once again into disrepute.